Across variables in the top level of a model are always defined with respect to a single global reference. In the picture below an electrical iconic diagram is shown with three voltages (u1 = 5 V, u2 = 3 V and u3 = 1 V). 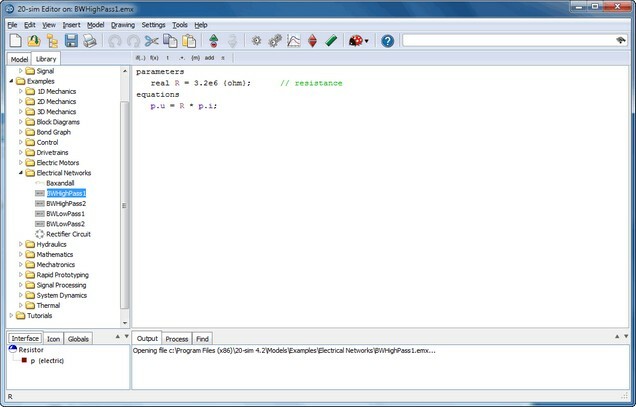 This means these voltages are all defined with respect to the same reference, e.g., the ground u = 0 V.
All variables values of a connection can be easily inspected during simulation by placing the mouse pointer on top of that connection as shown below. The connection between the mass and the spring (see picture below) shows an across value v = 0.84 m/s. This means the point where the mass and spring are connected has a global velocity of v =0.84 m/s. In the figure below the connection between the capacitor and the resistor shows a negative voltage of u = -2e-5 V.
where p.high and p_low are the ports to the connections at both sides of the resistor. p_high.u and p_low.u are voltages defined with respect to the global reference, but p.u is the voltage difference between the high and low port and therefore not defined with respect to the global reference. The definition of across variables depends on the definition of number of terminals of a port, which is shown in the Type Editor. To inspect the ports, put the mouse pointer on top of the Type section and select edit type from the right mouse menu.